1986 was a great year to be a New Yorker. The Statue of Liberty was turning 100 years old and that Fourth of July was set to be the best ever! The Mets were in the middle of a fantastic pennant race which would end in a World Series championship (not that I cared, being a Yankees fan.) But the most important thing to happen in my young life in 1986 was me turning 10 years old. Turning 10 meant a whole new slew of responsibilities and a bunch of hard fought freedoms. Those freedoms included being allowed to ride my bike to the video store to rent movies BY MYSELF! The flip side was I could be asked to bike to the grocery store by myself too, if we ran out of something midweek. Turning 10 also meant a substantial bump on the allowance front... $5.00 a week! Instead of blowing through my allowance I decided to save up. I really had nothing in mind to purchase, but I knew it would not be a clearanced toy, or a knock off or anything else along those lines. I made up my mind that for once in my life I was going to walk into a toy store and buy that latest, greatest thing I could. It was my mission. As the months past, I still could not figure out what to get, until I was watching TV one afternoon and a GI Joe commercial came on. I knew then I would go blow through my savings on GI Joes! I started slowly, buying a couple of figures at a time at the Woolsworth in Cityline. There wasn't anything very exciting about these purchases, other than I learned about sales tax and how much I disliked having to pay more than the posted price when I went up to the checkout. 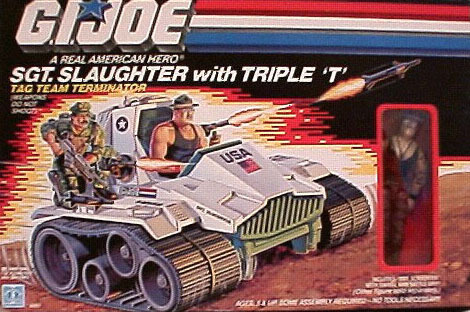 I remember that the boxed Joe vehicles were behind the counter, and being a rather shy kid it took forever to muster up the courage to ask the shopkeep for help. Actually, I mustered up the courage to ask my mom to ask the shopkeep for help. Before long we were on the way home, with my 2 vehicles! Boy, did I have fun playing with Sgt. Slaughter! I was a big wrestling fan as well as a GI Joe fan, so sometimes the Sarge would wrestle Cobra guys. Most times, the Sarge would go on solo missions, since seriously, would Sgt Slaughter NEED any backup? Most of my other Joes were usually captured and the Sarge would of course, be the lone man to break into Cobra headquarters and single handedly save each and every Joe. As 1986 wore on, my parents decided we were going to move from New York to Miami, Florida, to be closer to family. I was both excited and sad. I liked Florida. Everytime we went on vacation, we'd go to Disney World, go to the beach and have fun. What wasn't there to like about Florida? But at the same time I was sad because it did mean leaving behind all my friends, and my school. We packed up the house into a moving van and left Queens for good. In the U-Haul, I had made sure to pack all my GI Joes into my backpack so that I could play with them on way down to Florida. In fact, moments before getting into the truck, I had been playing with them in the hallway when my mom gave me the signal that it was time to go. I quickly packed them into my backpack and we were off. When we arrived at South of the Border, we dismounted as my dad wanted to take pictures, and get something to eat. I brought my Joes down with me. As my dad ran around posing for goofy pictures with my mother, I sat at a bench and looked into my backpack, looking for my favorite of all the Joes, Sgt Slaughter. It was then that it hit me... Sarge was doing recon ontop of the heater in the hallway at the old house in Queens, while me and the rest of the Joes were on the steps. I never packed him up! He was still there. I ran and told my mother, and all she said was, "I'll buy you another one when we get to Miami Beach." So I bided my time until we reached my grandparent's condo on Miami Beach. It was late at night. No shopping until morning. Morning came, and everyone was still tired from the trip, but I was insistent. Lincoln Road Mall had a Woolsworth, and I knew it, and I kept reminding my mom about it. When she finally relented and took me later on in the day, I came to discover that they did not have the Sarge in stock. I was heartbroken, but I was promised that the next time we saw him, I would get him. I never saw him on a store shelf again.